Manchester United take on Liverpool in a huge Premier League clash at Old Trafford in February and here we tell you everything you need to know about the upcoming fixture between the two arch-rivals. United are in red-hot form heading into the crunch fixture, with Ole Gunnar Solskjaer having overseen an incredible upturn in the club's fortunes since replacing previous boss Jose Mourinho in December. United have won every Premier League match except for a 2-2 draw at home with Burnley, a run that has lifted them into the top four of the league. However, they are coming up against a Liverpool team who are battling Manchester City for the title, with Jurgen Klopp's men heading into the match level on points with the champions. See Man Utd v Liverpool and the Carabao Cup Final between Chelsea and Man City with a special offer on our two football channels. Sunday, February 24, with the match kicking off at 2.05pm. Where is the match taking place? How else can you follow the game? How are the two teams shaping up? Both sides are in impressive form heading into the match, with United having won all but one of the league games their caretaker manager has been in charge of to help them surge up to fourth in the table. Liverpool, meanwhile, have lost just once in the Premier League in 2019, although that run has still seen them slip to second place behind City, albeit on goal difference and with a game in hand on the champions. What happened last time they met? Highlights from Liverpool's 3-1 win over Manchester United in the Premier League. 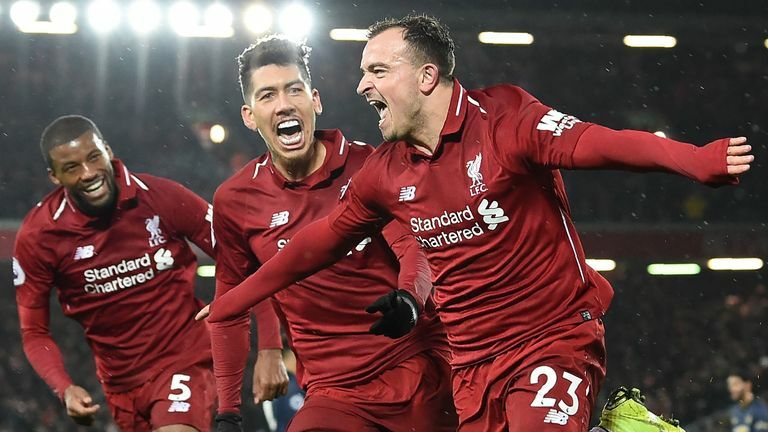 Swiss forward Xherdan Shaqiri came off the bench to make an instant impact with two second-half goals as Liverpool returned to the top of the table with a 3-1 win over United at Anfield back in December. What is the significance of the result? United, who currently lead fifth-placed Arsenal and sixth-in-the-table Chelsea by just a point, will maintain hold of a Champions League berth with victory over Liverpool. The visitors will need only a point to overtake City - who play Chelsea in the Carabao Cup final later that day - and return to the top of the standings. However, defeat for either team would hit those respective hopes hard.